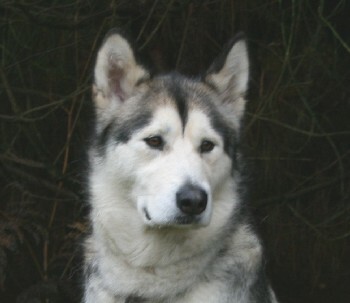 Narla is our first Alaskan Malamute and was named after a character in the Lion King. It’s due to her strong personality and love of people that we acquired more. She has a short coat that is very dense, with beautiful dark almond eyes. We only showed Narla lightly as she seemed to be more interested in washing the judge. My daughter Francine now shows Narla for junior handling and they have a very good rapport. Narla is loving and fun and greets everyone who comes to our house with a complete face wash! She adopted our second Malamute Mushu as her puppy when we brought her home.